Please remember that you can vote for my PoldaPop Flower Button Coat in the VintageModern Design Challenge through Thursday, March 22! Click here to vote. This week was a bit of a downer after last's week high level of productivity. I had some small things to finish up but nothing all that exciting or showy. And my energy level took a dive after all the late nights of the week before. I love losing myself in intensity, but I generally have to pay for it at some point! But I do have a few things to show. I helped out the Maiden Street School of Irish Dance by finishing off six skirts for their St Patrick's Day show. Can't you just imagine a whole army of little girls marching in a St Patrick's Day parade with these? They were going to pair them with black turtlenecks but I'm guessing they had to go for something lighter with our unseasonably warm weather. I earned myself some free classes for Cora and the owner is now going to refer new students to me so that they can get a matching skirt made for performances, so my good deed has certainly been rewarded. In the middle of the project I had to run to Hancock's to get more of the binding they had chosen for the waistband. This trip highlighted why I get so irritated with Hancock's. They were all out of the item I needed (black blanket binding), and when I asked one of the clerks (one that I like - I certainly know who to go to and who to avoid) if they had more squirreled away somewhere. She looked for me, and when she came up empty-handed explained, "We're always running out of the black." SO WHY DON'T YOU UP YOUR ORDER?????????? I know their trick of not having much of something the moment there's a 50% off sale (see if you can find any neutral colored invisible zippers when zippers are on sale), but this was full price. Humpf. 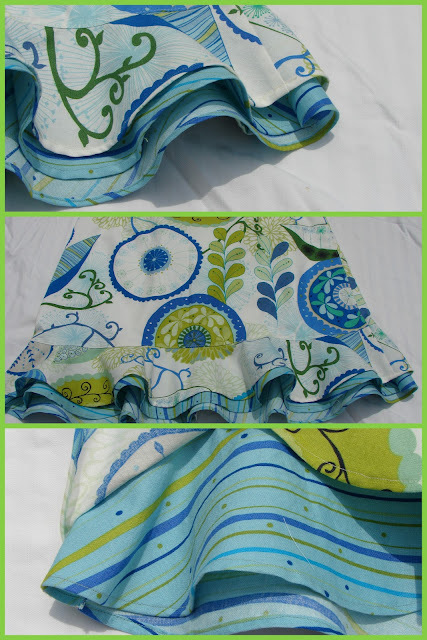 I made this skirt with a combination of Valori Wells fabrics from her Wrenly collection. And it came out the way it did as a happy accident. Eileen wanted the vertical stripe fabric for the background ruffle. This was my first peplum style ruffle, and I didn't think about the fact that the stripe would become diagonal and then horizontal because of how the peplum is cut. Luckily Eileen liked it this way! One of the things that I love about sewing is how often a problem becomes a opportunity to be more creative. I wore it to Devon's reading and got a lot of compliments (even before people knew that I had made it!) so I think it was a success. I used a cotton interlock that I bought on clearance at fabric.com ages ago, so I wasn't worried if it didn't work out (I've got some jersey I paid $12/yard for but I'm saving that until I feel more confidenct). I used interfacing on the shoulders and faced the neckline to give it a nice edge. I used a rolled hem for the sleeves and hemline and while I kind of like the scallop-y edges, I need to figure out how NOT to do that, too. I think I'll tweak it a bit more then put up a tutorial for it, for those of you who want to D-I-Y. This week will be a little light project-wise. I'm attending the Original Quilting and Sewing Expo in Schaumburg from Thursday through Saturday (thank goodness the girls have willing and doting grandparents) so I plan to finish up a few more leftovers then get my learnin' cap on. I so hope I can bring home a batch of new skills and ideas! 2 comments on "What's Up: Bits 'n Bobs"